Europe’s Rosetta spacecraft is en route to intercept a comet– and to make history. In 2014, Rosetta will enter orbit around comet 67P/Churyumov-Gerasimenkoand land a probe on it, two firsts. Rosetta’s goal is to learn the primordial story a comet tells as it gloriously falls to pieces. As their elongated orbits swing them closer to the sun, comets transform into the most breathtaking bodies in the night sky. A European Space Agency mission launched in 2004 with U.S. instruments on board, Rosetta will have a front-row seat for the metamorphosis. What we know of comets so far comes from a handful of flyby missions. At the moment, Rosetta is “resting up” for the challenges ahead. It’s hibernating, engaged in its high-speed chase while fast asleep. Reveille is on or around New Year’s Day 2014, when the spacecraft begins a months-long program of self-checkups. If all goes well, in August of the same year, Rosetta will enter orbit around 67P’s nucleus and begin scanning its surface for a landing site. Once a site is chosen, the spacecraft will descend as low as 1 km to deploy the lander. The lander’s name is “Philae” after an island in the Nile, the site of an obelisk that helped decipher—you guessed it—the Rosetta Stone. Touchdown is scheduled for November 2014, when Philae will make the first ever controlled landing on a comet’s nucleus. “When we land, the comet could already be active!” says Alexander. Because a comet has little gravity, the lander will anchor itself with harpoons. “The feet may drill into something crunchy like permafrost, or maybe into something rock solid,” she speculates. Once it is fastened, the lander will commence an unprecedented first-hand study of a comet’s nucleus. Among other things, it will gather samples for examination by automatic onboard microscopes and take panoramic images of the comet’s terrain from ground level. Meanwhile, orbiting overhead, the Rosetta spacecraft will be busy, too. Onboardsensors will map the comet’s surface and magnetic field, monitor the comet’s erupting jets and geysers, measure outflow rates, and much more. 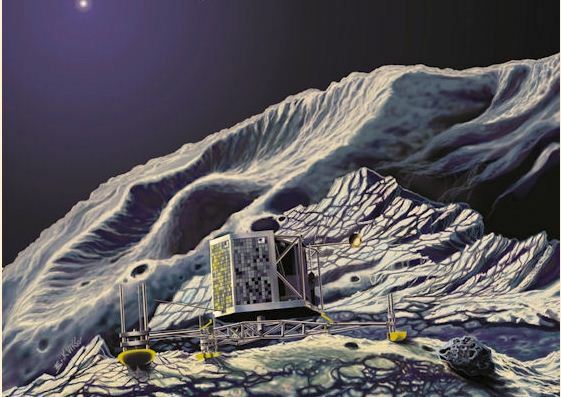 Together, the orbiter and lander will build up the first 3D picture of the layers and pockets under the surface of a comet. The results should tell quite a story indeed…. 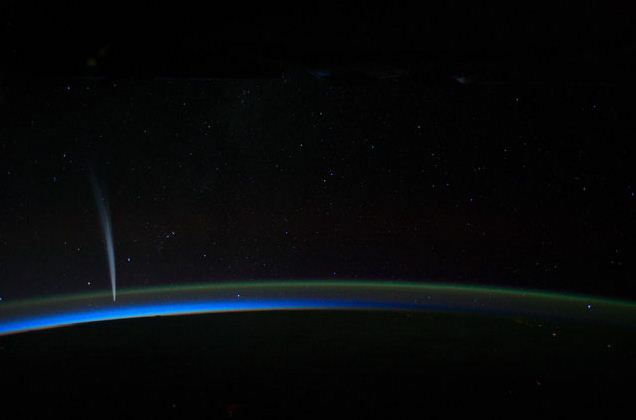 Ιnternational Space Station Commander Dan Burbank captured spectacular imagery of Comet Lovejoy as seen from about 240 miles above the Earth’s horizon on Wednesday, Dec. 21. Today Burbank described seeing the comet two nights ago as “the most amazing thing I have ever seen in space,” in an interview with WDIV-TV in Detroit. Last night he captured hundreds of still images of the comet. Comet Elenin is no more. Latest indications are this relatively small comet has broken into even smaller, even less significant, chunks of dust and ice. This trail of piffling particles will remain on the same path as the original comet, completing its unexceptional swing through the inner solar system this fall. Here's all that remains of Comet Elenin (C/2010 X1), as imaged on October 21 and 23, 2011, using a 4-inch refractor and stacks of twelve 5-minute exposures. A small red X marks the comet's predicted location in each frame. The short streak at far right is the unnamed asteroid 138524 (magnitude 14.5). Twelve millennia may be a long time to Earthlings, but for those frozen inhabitants of the outer solar system who make this commute, a dozen millennia give or take is a walk in the celestial park. Comet Elenin came as close as 45 million miles (72 million kilometers) to the sun, but it arrived from the outer solar system’s Oort Cloud, which is so far away its outer edge is about a third of the way to the nearest star other than our sun. For those broken up over the breakup of what was formerly about 1.2 miles (2 kilometers) of uninspiring dust and ice, remember what Yeomans said about comets coming close to the sun – they fall apart about two percent of the time. Comet Elenin first came to light last December, when sunlight reflecting off the small comet was detected by Russian astronomer Leonid Elenin of Lyubertsy, Russia. 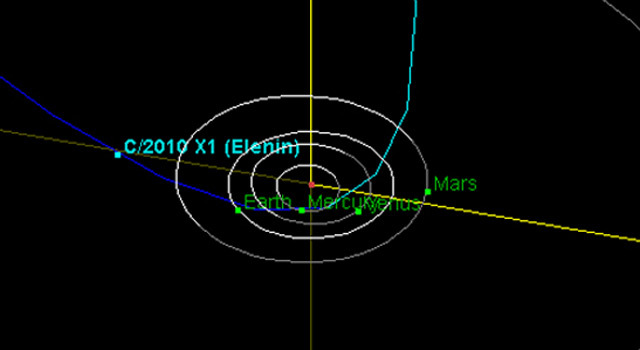 Also known by its astronomical name, C/2010 X1, Elenin somehow quickly became something of a “cause célèbre” for a few Internet bloggers, who proclaimed this minor comet could/would/should be responsible for causing any number of disasters to befall our planet. Internet posts began appearing, many with nebulous, hearsay observations and speculations about earthquakes and other disasters being due to Elenin’s gravitational effects upon Earth. NASA’s response to such wild speculations was then in turn speculated to be an attempt to hide the truth. Yeomans knows that while Elenin may be gone, there will always be Internet rumors that will attempt to conjure up some form of interplanetary bogeyman out of Elenin, or some equally obscure and scientifically uninteresting near-Earth object. Thinking of ways to make himself any more clear about the insignificance of this matter is somewhat challenging for a scientist who has dedicated his life to observing asteroids and comets and discovering their true nature and effects on our solar system. NASA detects, tracks and characterizes asteroids and comets passing relatively close to Earth using both ground- and space-based telescopes. 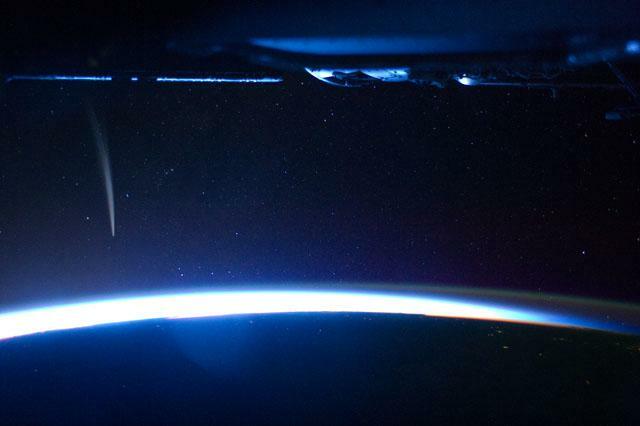 The Near-Earth Object Observations Program, commonly called “Spaceguard,” discovers these objects, characterizes the physical nature of a subset of them, and predicts their paths to determine if any could be potentially hazardous to our planet. There are no known credible threats to date. 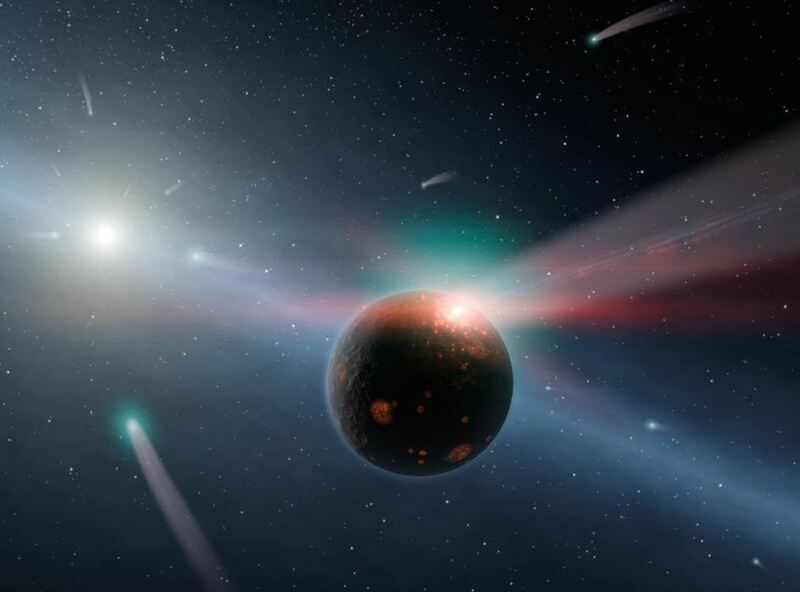 This artist’s conception illustrates a storm of comets around a star near our own, called Eta Corvi. Evidence for this barrage comes from NASA’s Spitzer Space Telescope, whose infrared detectors picked up indications that one or more comets was recently torn to shreds after colliding with a rocky body. In this artist’s conception, one such giant comet is shown smashing into a rocky planet, flinging ice- and carbon-rich dust into space, while also smashing water and organics into the surface of the planet. 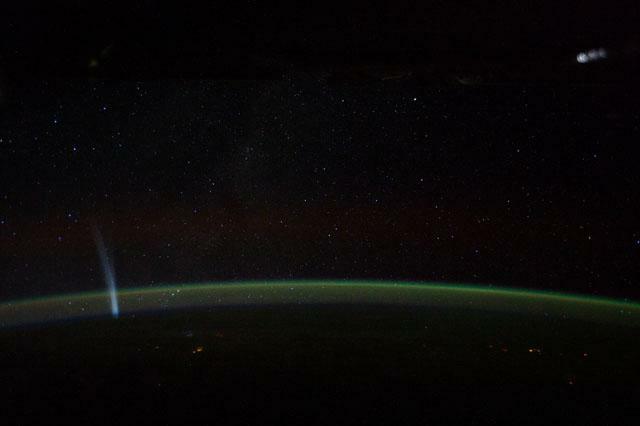 A glowing red flash captures the moment of impact on the planet. Yellow-white Eta Corvi is shown to the left, with still more comets streaming toward it. Spitzer detected spectral signatures of water ice, organics and rock around Eta Corvi — key ingredients of comets. This is the first time that evidence for such a comet storm has been seen around another star. Eta Corvi is just about the right age, about one billion years old, to be experiencing a bombardment of comets akin to what occurred in our own solar system at 600 to 800 millions years of age, termed the Late Heavy Bombardment. Scientists say the Late Heavy Bombardment was triggered in our solar system by the migration of our outer planets, which jostled icy comets about, sending some of them flying inward. The incoming comets scarred our moon and pummeled our inner planets. They may have even brought materials to Earth that helped kick start life. NASA’s Spitzer Space Telescope has detected signs of icy bodies raining down in an alien solar system. The downpour resembles our own solar system several billion years ago during a period known as the “Late Heavy Bombardment,” which may have brought water and other life-forming ingredients to Earth. During this epoch, comets and other frosty objects that were flung from the outer solar system pummeled the inner planets. The barrage scarred our moon and produced large amounts of dust. “We believe we have direct evidence for an ongoing Late Heavy Bombardment in the nearby star system Eta Corvi, occurring about the same time as in our solar system,” said Carey Lisse, senior research scientist at the Johns Hopkins University Applied Physics Laboratory in Laurel, Md., and lead author of a paper detailing the findings. The findings will be published in the Astrophysical Journal. Lisse presented the results at the Signposts of Planets meeting at NASA’s Goddard Space Flight Center in Greenbelt, Md., today, Oct. 19. Astronomers used Spitzer’s infrared detectors to analyze the light coming from the dust around Eta Corvi. Certain chemical fingerprints were observed, including water ice, organics and rock, which indicate a giant comet source. The Kuiper Belt was home to a vastly greater number of these frozen bodies, collectively dubbed Kuiper Belt objects. About 4 billion years ago, some 600 million years after our solar system formed, scientists think the Kuiper Belt was disturbed by a migration of the gas-giant planets Jupiter and Saturn. This jarring shift in the solar system’s gravitational balance scattered the icy bodies in the Kuiper Belt, flinging the vast majority into interstellar space and producing cold dust in the belt. Some Kuiper Belt objects, however, were set on paths that crossed the orbits of the inner planets. The resulting bombardment of comets lasted until 3.8 billion years ago. After comets impacted the side of the moon that faces Earth, magma seeped out of the lunar crust, eventually cooling into dark “seas,” or maria. When viewed against the lighter surrounding areas of the lunar surface, those seas form the distinctive “Man in the Moon” visage. Comets also struck Earth or incinerated in the atmosphere, and are thought to have deposited water and carbon on our planet. This period of impacts might have helped life form by delivering its crucial ingredients. “We think the Eta Corvi system should be studied in detail to learn more about the rain of impacting comets and other objects that may have started life on our own planet,” Lisse said. Geometry of Bonilla’s observation: Z (Zacatecas), M (Mexico City or Puebla) and O is the point at which objects were observed. D is the distance from the Zacatecas Observatory to the objects and d is the distance between Zacatecas and Puebla or between Zacatecas and Mexico City. On 12th and 13th August 1883, an astronomer at a small observatory in Zacatecas in Mexico made an extraordinary observation. José Bonilla counted some 450 objects, each surrounded by a kind of mist, passing across the face of the Sun. Today, Hector Manterola at the National Autonomous University of Mexico in Mexico City, and a couple of pals, give a different interpretation. They think that Bonilla must have been seeing fragments of a comet that had recently broken up. This explains the ‘misty’ appearance of the pieces and why they were so close together. But there’s much more that Manterola and co have deduced. They point out that nobody else on the planet seems to have seen this comet passing in front of the Sun, even though the nearest observatories in those days were just a few hundred kilometres away. That can be explained using parallax. 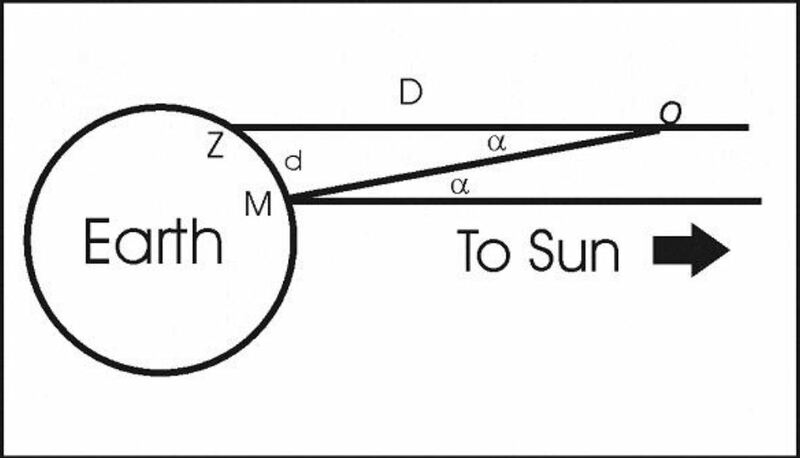 If the fragments were close to Earth, parallax would have ensured that they would not have been in line with the Sun even for observers nearby. And since Mexico is at the same latitude as the Sahara, northern India and south-east Asia, it’s not hard to imagine that nobody else was looking. Manterola and pals have used this to place limits on how close the fragments must have been: between 600 km and 8000 km of Earth. That’s just a hair’s breadth. What’s more, Manterola and co estimate that these objects must have ranged in size from 50 to 800 km across and that the parent comet must originally have tipped the scales at a billion tonnes or more, that’s huge, approaching the size of Halley’s comet. That’s an eye opening re-examination of the data. 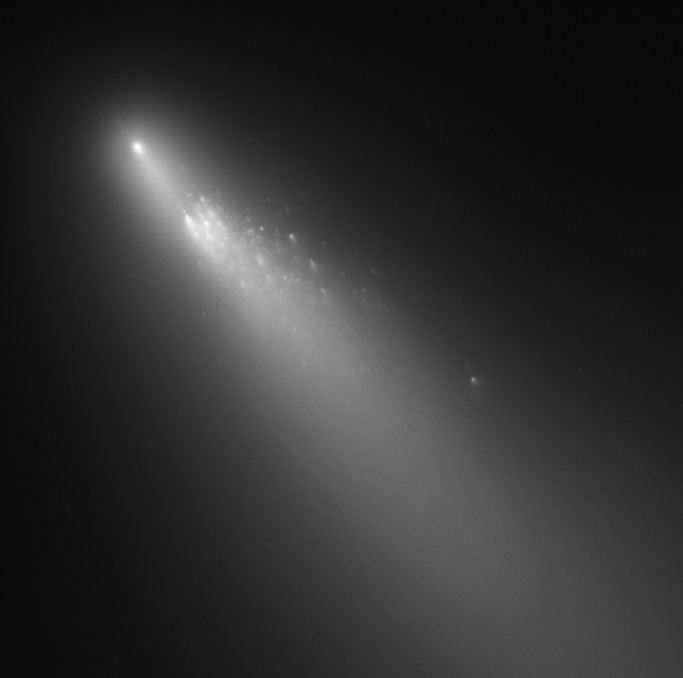 Astronomers have seen a number of other comets fragment. The image above shows the Schwassmann-Wachmann 3 comet which broke apart as it re-entered the inner Solar System in 2006. There’s no reason why such fragments couldn’t pass close by Earth. One puzzle is why nobody else saw this comet. It must have been particularly dull to have escaped observation before and after its close approach. However, Manterola and co suggest that it may have been a comet called Pons-Brooks seen that same year by American astronomers. Manterola and co end their paper by spelling out just how close Earth may have come to catastrophe that day. They point out that Bonilla observed these objects for about three and a half hours over two days. This implies an average of 131 objects per hour and a total of 3275 objects in the time between observations. NASA-funded researchers have evidence that some building blocks of DNA, the molecule that carries the genetic instructions for life, found in meteorites were likely created in space. The research gives support to the theory that a “kit” of ready-made parts created in space and delivered to Earth by meteorite and comet impacts assisted the origin of life. On Nov. 4, 2010, NASA’s EPOXI spacecraft came within 450 miles of Comet Hartley 2, a small comet not even a mile in diameter, which takes about six and a half years to orbit the sun. 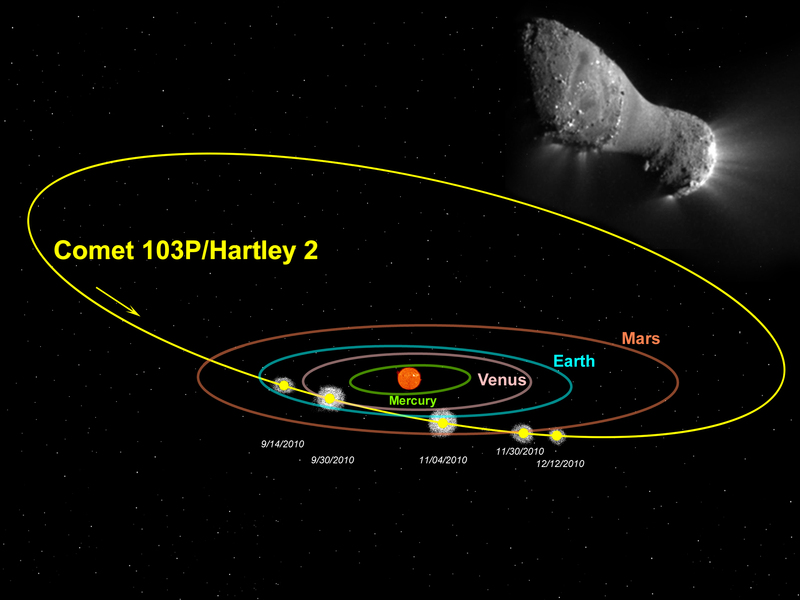 Designated officially as 103P/Hartley 2, the comet thus became the fifth for which scientists have collected close-up images. But the comet was also observed from another spacecraft: the Solar and Heliospheric Observer (SOHO), better known for its observations of the sun. 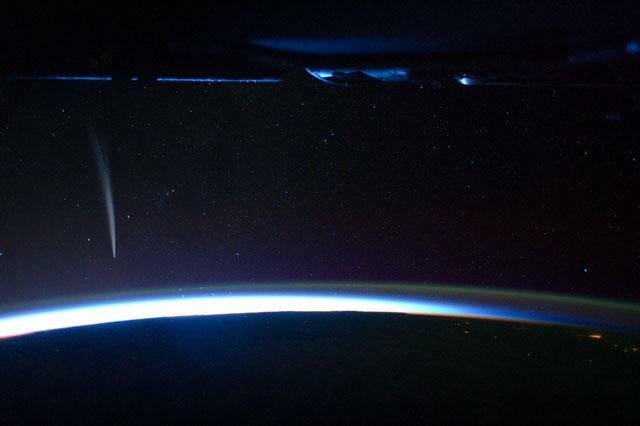 Together, the two returned data about what appears to be an irregular comet, belching chunks of ice and losing water at a surprisingly fast pace.